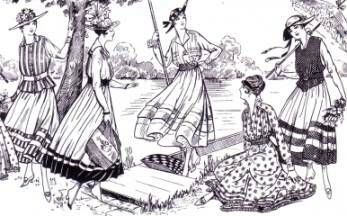 A new look in women's fashion developed in 1908 and carried over into the early 1910s. The definable style of the decade lasted until 1918, at which time the trends of the 1920s began to set in. 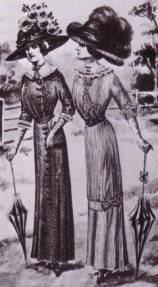 In 1908, the unnatural "S" figures that were pushed and pulled with bustles and corsets were replaced with a straight, natural figure. The waist was loosened, and a straight line was adopted. Additionally, the frills and flounces of the previous decade were gone. 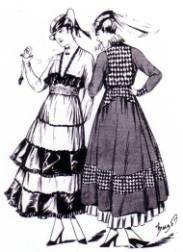 The hobble skirt, seen below, caught on quickly. 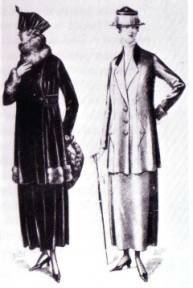 This style remained the height of fashion until around 1915. 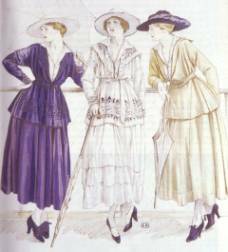 In 1915, the hobble skirt was replaced with a full skirt cut just above the ankles. The V-neck was the popular neckline of the second half of the 1910s. The fuller skirt was quite appropriate for more casual, outdoor wear. 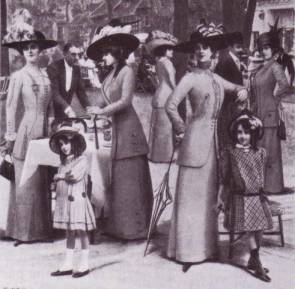 By 1918, clothes were becoming straighter and more curveless. The boyish look of the 1920s began to evolve during the late years of the 1910s.